Free shipping. Buy direct from HP. 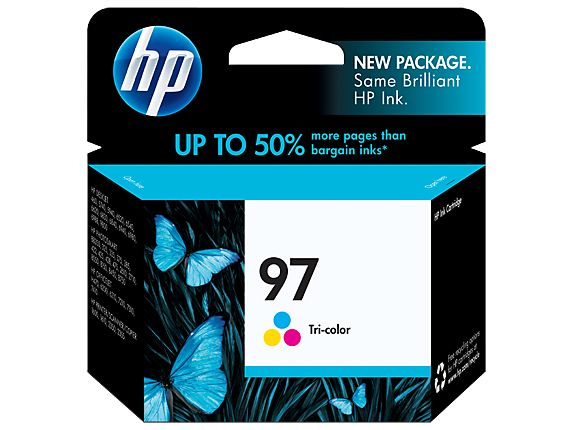 See customer reviews and comparisons for the HP 97 Tri-color Original Ink Cartridge. Upgrades and savings on select products. Print rich, lifelike colors, vibrant photos and graphics that resist fading for generations. Original HP ink cartridges, HP printers and HP papers are designed as an integrated printing system to deliver exceptional print quality. 1 Using Original HP inks on HP Premium Plus Photo Papers. Based on Wilhelm Imaging Research, Inc. light fade testing under glass. For more information on additional permanence testing factors see http://www.hp.com/go/premiumplusphoto. 2 HP ink cartridge return and recycling is currently available in more than 30 countries in Asia, Europe, and North America through the HP Planet Partners program. 3 Using genuine HP supplies ensures availability of all HP printing features.